In the parking lot of Lueders Park in Compton, adjacent to a dilapidated trailer park and the Louis II Burgers Drive-Thru, a small revolution in healthcare is taking place. Next to a large, gray Ford Transit van are three small, white tents bearing the emblem of Martin Luther King, Jr. Community Hospital (MLKCH). Healthy snacks are piled on a buffet table. Nearby tabletops beckon with fake gold and silver coins, sparkling dollar-store jewels, cartons of crayons, stickers, and a table bearing pictures of celebrities ranging from Will Smith to Mother Teresa. It looks like a children’s arts-and-crafts area, and the idea is to have fun—but with the aim of solving a serious problem. Compton, and South Los Angeles in general, is one of the most medically-underserved areas of the nation. Experts at MLKCH estimate the hospital’s service area has a physician gap of 1,200 doctors—average US communities have 10 times more doctors than this area. One-third of the population report difficulty finding a provider or getting care. Death from diabetes and cardiac-related complications is double the rest of the county. The volunteers staffing this small collection of tents are here to find out how to change these statistics. Their goal: Talk directly to community members in parks, housing projects, and shopping centers, to learn how to get healthcare to people in places where there is no doctor. Some of the people here today—including John Abernethy, Alex Grishaver, Shelagh McLellan and Krishna Ramachandran—are from Greenfield Labs (GFL), a partnership between Ford Motor Company and design company IDEO. The GFL team is here, along with hospital staff, and staff from the MLK Community Medical Group, to tease out what a mobile health solution should do, look like, feel like and even be named. A key goal of this learning-based partnership is to use human-centered design to understand the drivers of community health challenges. GFL is an incubator of mobility services using creativity and community-based research to foster solutions to pressing social and mobility challenges. 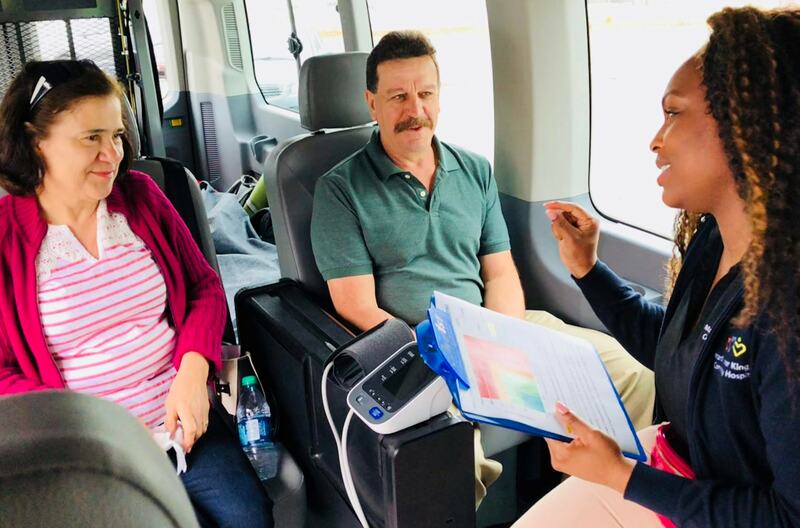 GFL and Ford Smart Mobility’s GoRide Non-Emergency Medical Transportation (NEMT) Team are engaged in an innovative learning-based partnership with MLKCH. Ford’s GoRide NEMT business plans to use these insights to help develop innovative services that enhance customer experience and bring healthcare to communities. Take, for example, the “treasure” table—a play space where community members can choose one gold, one silver, and one precious (plastic) jewel to put in an assortment of buckets labeled with various health conditions. Which health conditions are the most important to address and thus get the jewel? Which are less important and merit the silver? By the end of the day, the buckets with the most “treasure” will tell researchers what they need to know. These kinds of games “make it fun,” said Cynthia, who noted that more conventional information-gathering techniques, such as written surveys, tend to turn people off. They expect to have 40-50 responses by the end of the day and will perform similar outreach events between now and August. Dr. Reyno and his colleague, MLK Community Medical Group urologist Dr. Alan Kaplan, originally presented the mobility and health challenge to GFL: How do we get the thousands of patients MLKCH doctors see in the emergency room each year to primary care that can prevent those emergency visits? Providing healthcare alone is also not enough, the team found. People need to be connected to the resources and services that directly impact health. Housing, for example, is a critical need in Compton, cited even by people who have homes because of the large concentrations of homeless visible on city streets. “There ain’t no shelters. We need of lot of help,” says a homeless woman wearing a leopard-skin-patterned fedora and a blue knee brace. She fills two heaping plates of cheese and fruit and takes a cup of yogurt to go as she answers questions from the GFL staff. What do you need? First, she says, “Shelter.” Then, she adds housing, clothing, food, transportation. After a brief discussion about her pre-diabetes, she also says she could use blood sugar testing. A sheriff’s car drives by to see what’s going on, one of two that will pass by this morning. Context is huge in South LA. The MLKCH-GFL team has taken care to choose colors for their advertising that are not gang-related. They have put up a map, so community members can pin flags where they think the clinic should be stationed. So far, it shows clusters of flags around three major housing projects. And the team chose a test name for their prototype mobile clinic—“Boost Health”—that they can change if it does not sit well with the community.